You will not find any whimsical twists in this writing. There are no stories of family jokesters, no descriptions of family outlaws, no remembering the aunt who forgot to put sugar in the pumpkin pie. What you will find in this writing is passion, commitment, appreciation, and love. Usually, my writings focus on one person, but this writing is about two people. The first person is the school teacher from Wyoming who fell in love with a budding Montana rancher, married him, and moved to the remote country southeast of Biddle, Mont., and who brought into this marriage five children. The second person in this writing is the lady who knew her 59-year-old husband was gone long before they arrived in Spearfish, S.D., even though the ambulance folks continued with their CPR efforts. The University of Wyoming educated school teacher sure had no idea that her life was about to take a different direction when she drove to southeastern Montana in 1970 for a summer visit with her brother, who was working on a ranch. In 1972, when fall showed up, the young brown-haired teacher did not return to her home at Moorcroft, Wyo., to teach at the Green River school where she had taught for the previous five years. Instead, she packed her clothes, a few personal possessions and her accordion, and started life as Mrs. Leland Brimmer. In harmony with the hills and tall pines that dominate the landscape of the Brimmer ranch, the new bride’s music spread deep roots into daily life. Like a well-worn winter coat, it was part of the new Mrs. Brimmer. It was her. 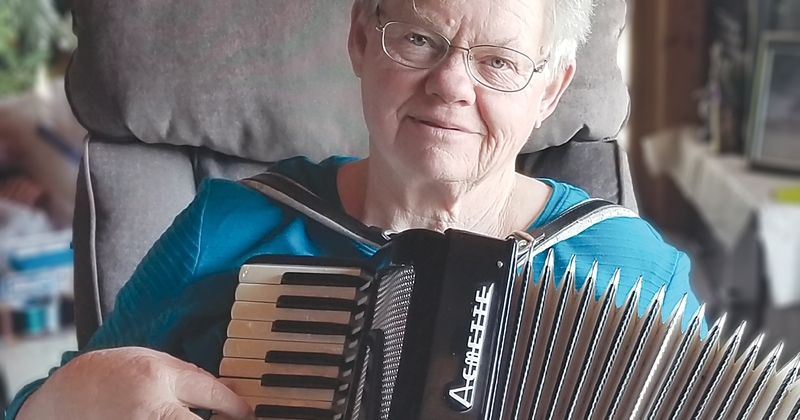 “As a little girl, I remember always wanting to play accordion.” She and her father drove to the music store in Casper, Wyo., and came home with her accordion. It was a dream come true. She has two other push-and-pull boxes, but the used one her father bought overflows with memories and will always have top spot on the shelf. It’s been almost 60 years since that memorable trip to the Casper music store. Mrs. Brimmer has gained a few pounds, and her brown hair is streaked with some gray. At 73, her step is a bit more cautious, and her fingers don’t move around the accordion like they used to. This writer has precious little music ability, so when Mrs. Brimmer ran her fingers over the accordion, explaining how it works, how it’s a reed instrument and doesn’t get out of tune, and that it is put together with bees wax, I found myself lifting the pen off my note paper and focusing on the love that came pouring out of Mrs. Brimmer’s eyes, the smile I hadn’t seen in the first part of our interview. I looked out the big picture window, tried to put together a picture of a young Mrs. Brimmer playing music as her little kids sat on the floor. It was that special moment I always look for in my writing. Now, we put down the pen and leave the accordion lady behind. Oh, but first we need to give our accordion lady a name — Hilda Ann Brimmer. She’s the other lady in this writing, a woman who never missed a step in keeping the family business running when her husband passed 15 years ago. And the name of this remarkable lady — Hilda Ann Brimmer. In 2010, the Brimmer Ranch celebrated 100 years of existence. It started out as a homestead. Today, with the help of a daughter, Mrs. Brimmer keeps the sheep and cattle ranch going. We walked amongst the sheep as family and neighbors docked the lambs. Mrs. Brimmer noted lamb prices should be good this year. She recalled years ago when she and Leland left the sale ring where they had watched their 125-pound lambs bring $30. Today, this stocky Estonian lady admits that when she runs out of groceries, she does not make a special trip to town, but she will right quick get in her old Suburban if they need vaccines or mineral for the animals and head out. Before they make any business decisions, Mrs. Brimmer visits with her daughter Leann. When we first spoke, Mrs. Brimmer explained her place is primitive — no TV, no internet. Just a radio to get the morning news. Mrs. Brimmer does all the books for the ranch. It’s a big job. Indeed it was obvious from the short time we spent together, this woman knows the sheep and cattle business. She pointed to the short fine grass growing amongst the tall pines. The sheep do well on this grass and on the gumbo prairie of our summer pasture. By the time October comes around, the lambs are good-sized, very desirable in the marketplace. But the wool is good, too. Wool sheared from the ewes brings in part of the income. According to Mrs. Brimmer, the ewes have good clean fleeces in this country. Leann is a sheep person and has been since her toddling days. She lives and breathes sheep. Loves the shearing work. She is a world-class wool evaluator, as good as anyone in the business. The Brimmer Ranch must continue and never be sold, Mrs. Brimmer insisted.